Writer, Pages, Word, and other word processors have easy ways of exporting documents to PDF (Portable Document Format), and these documents turn out well when they are viewed on different devices with different applications. EPUB, however, is more complex than PDF. This open format, developed by the International Digital Publishing Forum. An EPUB document is a collection of several different documents, particularly XHTML and XML ones, that are zipped together into a single-file format that defines and structures a publication. It uses metadata to describe and structure the document. EPUB has its advantages over PDF. The biggest advantage is text size can be readjusted to fit the screen you are viewing it on, even small devices. This is referred to as reflow. EPUB also makes it easier to add audio and video to a book. Readers can listen and watch on multiple devices. However, not every PDF reader will be able to render audio and video. 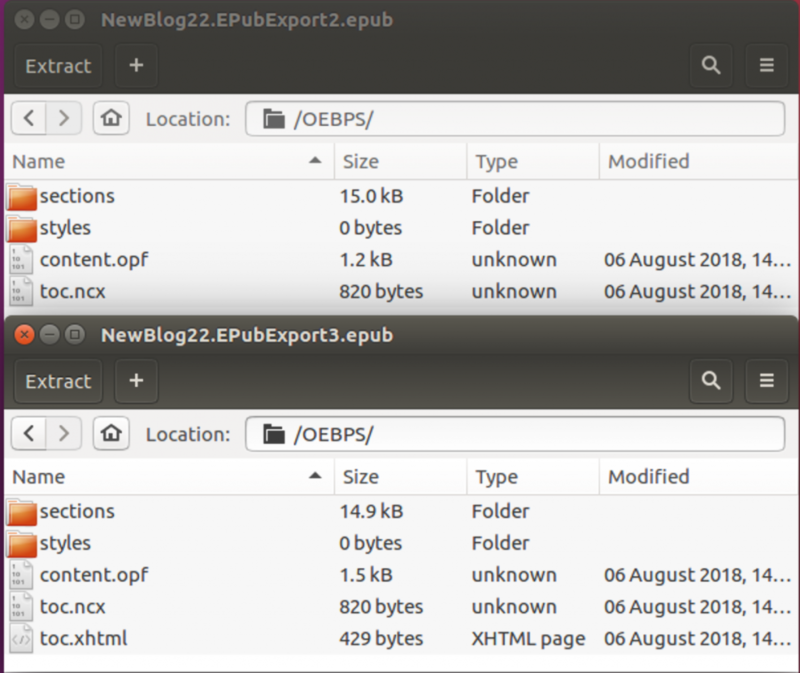 The Forum released two versions of EPUB: 2.0 and 3.0. Version 2.0 was released in 2007 with .epub as the file extension. Version 3.0, released in 2011, supports fixed layouts, which are popular for comic books, and MathML (Mathematical Markup Language), which is used for describing mathematical notation in XML documents. 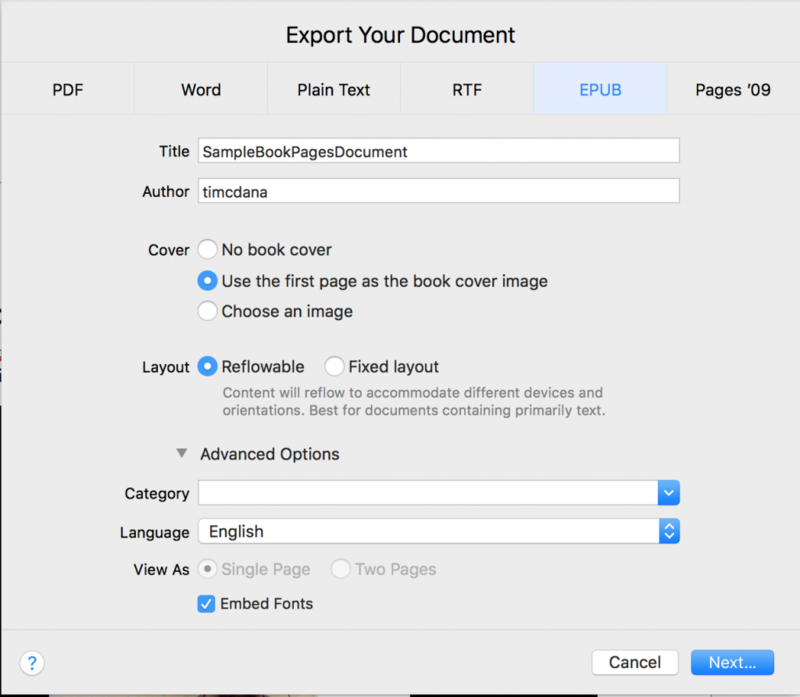 The word processors that support exporting to PDF will allow the user to create metadata, have some control over defining pages, and to choose whether the document is reflow or static. More work is typically required to be done to these exported documents to get them ready for a store or distributor, however. Version 6.0 of Writer has an export item in the File menu that allows you to choose the version of EPUB and choose whether each section in the book will be defined by Heading 1 or a page break. This will set up the EPUB document, so it can be edited further in another application. There are two choices for EPUB: Export as EPUB and Export Directly as EPUB. Click Export as EPUB to launch the dialog. Click Export Directly as EPUB to open the Export dialog and saving it like any other file format. 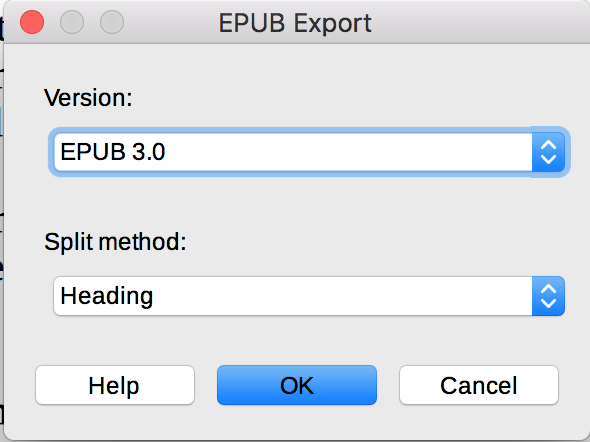 Following the first sub-point under step 3 launches the EPUB Export dialog. It has two drop-down menus. The first lets you choose the version of EPUB. The second lets him choose whether headings or page breaks will define book sections. As mentioned in the EPUB section of this article, there are several differences between versions 2 and 3 of the format. When you select version 3.0 in the first drop-down menu, Writer will generate a toc.xhtml document as one of the documents that compose the EPUB file. A toc.xhtml document is a standard part of an EPUB 3.0 document. Version 6.0 of Writer does not export images with the other documents. The next version will have a more advanced dialog and support image exportation. An alternative to version 6.0 is installing an extension that was developed for exporting documents in the ODT format to EPUB, called Writer2ePuB. It works with 6.0, as well as older versions of Writer. Images will be included in the exported EPUB file. When it is installed, three icons are placed in the Standard toolbar: writer2epub, metadata, and preferences. The first and second icons do the same thing. They open a dialog where the user can enter metadata, such as the title, ISBN, and author. There is also a tab for document preferences. It allows the user to choose how the documents are split and the quality of images. The third icon is for the Writer2ePuB preferences It allows you to choose whether or not to close the document after conversion and keep the working files. The extension gives users more options and more control over the export than the export feature in version 6.0 of Writer. 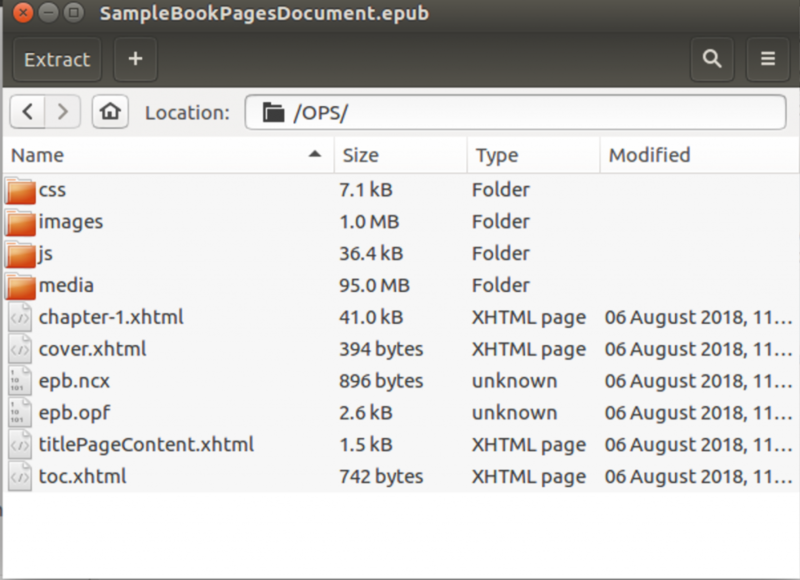 The EPUB document can be opened in readers, like Calibre and Adobe Digital Editions. However there may be a lot of work that needs to be done to the documents that compose the book. The dialog in Pages allows you to add metadata to the document and choose whether the ebook will reflow or be static. In most cases LibreOffice Writer is the superior word processor to Apple Pages. It has more features; it is more flexible; and it can work with more file formats. However, Pages is much better at creating EPUB documents. The dialog that appears when export to EPUB is selected in the File menu. It allows you to choose whether the document is reflowable or a fixed layout. It also allows you to add metadata, such as the title and author. It exports documents to EPUB 3.0. Highlight the Export To sub-menu. Pages works best with another Apple product, iBooks. When you design a book in Pages and export to EPUB, it will be ready for iBooks. The layout, images, and video used will look good when the exportation is open in iBooks. The exportation can also be opened in other readers, like Calibre and Adobe Digital Editions. It may not look as good as it does in iBooks, however. Pages’ EPUB exportation is different than the ones LibreOffice and other applications produce. The structure of the folder and the files in the folder are different. These added documents and folders optimize the created books on Apple applications. Several word processors have made it easier for authors to publish ebooks. Several, like Word, have plugins for formatting a book to submit a book to Amazon’s Kindle store. Others can export documents into the EPUB format, which is the format many ebook distributors, such as Google and Barnes and Nobles, use. LibreOffice and Apple Pages are two word processors that export to EPUB. They, however, are only offer a first step to publishing an ebook. You must either directly edit the HTML, XML, and CSS documents or use an application to edit them after the EPUB is generated. Currently, Pages is more advanced than LibreOffice in this area. You can embed images and video in the document you are writing, and they will be present in the file when you export the Pages document. The Pages exportation is designed for iBooks. Work is required to make it ready for another distributor. LibreOffice’s exportation complies more with the open EPUB format with its files and structure. However, images will not be included, unless you use the Writer2ePuB plugin. The exportations will also likely require work before they are sent to the distributor of choice. In the future, word processors may become more advanced, and books will be able to be exported into formats that are ready or almost ready for a particular distributor.